Nerd Girl: NumberOneOnTheList.com. Professional, mobile-friendly websites and SEO help. It’s better if you’re on top. Tom: Hi. 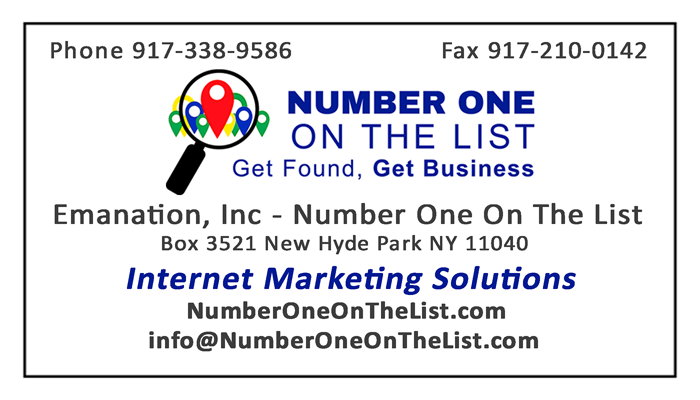 Tom Jacoby here at NumberOneOnTheList.com, and I want to talk to you about how to get noticed by the search engines, how to rank well when a search is done for your product or service. Okay? All right. First thing, your URL, your Uniform Resource Locator, your website address, should contain whatever it is, whatever the primary keyword is for your business. For example, if you have a hamburger restaurant that specializes in the bacon double cheeseburger, then bacondoublecheeseburger.com, cheeseburger.com, Hicksvillecheeseburger.com, Hicksvillebaconcheeseburger.com, those are all great URLs, Uniform Resource Locators. So those are good web addresses. Now, it doesn’t stop there, the next thing is each page of your website should be concentrated or focused on a different keyword. You don’t want to put them all on the same page, don’t use all your keywords at once, because if the keyword “cheeseburger” is worth 100 Google bucks, and you also want to include the keyword “shoestring French fries,” all right, so you can use those both on the same page. Now, they’re each worth 50 Google bucks. Now, if you want to include another two keywords, now they’re each worth 25 Google bucks. You get the idea. So you want to go one keyword for page, one primary keyword for page. It’s not the only thing you should talk about but it’s what you should focus on. So your URL contains your primary keyword for the website. Your title for a particular webpage contains the focused keyword for that page. You can tell what your title is by opening a page in your browser and you look up on top of the tab of the browser window that’s open on your browser. So the browser window at the top has a tab, the tab has words on it, those words tell you what the title of your webpage is. This is also how they come up on search. When you look at search engine results, the top thing, the link, that’s your title. Underneath that comes words that are description, which is, logically enough, your description. Now your title, you want to keep short. No long rambling titles. Short, short, short title. Fifty characters and spaces, thereabouts. Your description, you can now roll out a bit. Figure 150 characters and spaces or thereabouts. Now, although you’re rolling out, you’re not going to throw in a whole bunch of more keywords. All right, so back to cheeseburger. So you can now under the description, you can describe your cheeseburger. All-natural, grass-fed beef, organic beef, charcoal-grilled, hickory-smoked, whatever, you see? But you’re expressing this in English, you’re not just going, “keyword, keyword, keyword, keyword, keyword,” no, no, no. You’re saying this in sentences, you’re describing it. Now, when you’re describing, try to get rid of your adjectives and adverbs. You don’t want to say, “Great, the best, top.” No, you want to just keep it to things that actually describe your bacon double cheeseburger, your specialty of the house. So your description is informative about what it is that you do. So what we’ve got now is we’ve got a URL, you’ve got your web address that contains your keyword. Next, you’ve got your page title that also contains your keywords, then you’ve got a description that’s about your keyword as well. What else? Your content, and your content should also…if the title of the address is “cheeseburger,” and the title is “cheeseburger,” and the description describes your lovely cheeseburgers, then your content has to be all about cheeseburgers. The history of the cheeseburger. How do you prepare your cheeseburgers, where do you get your beef, where do you get your other ingredients. Do you see what I mean? You don’t want to just brush over this. All right. Most people are searching the internet on their smartphones. So you need to be visually based. In order to be visually based, you need a short video, short, short, short video. Or an image that says what it is. So somebody looks at the image and they go, “Aha, I see what this is.” Thirty percent of all Internet commerce comes from smartphones. That’s as of now, that number is just growing. But this is supposed to be a short video. I’m going to keep it short, but I will continue on another one. All right, thanks a lot for listening, I appreciate that.